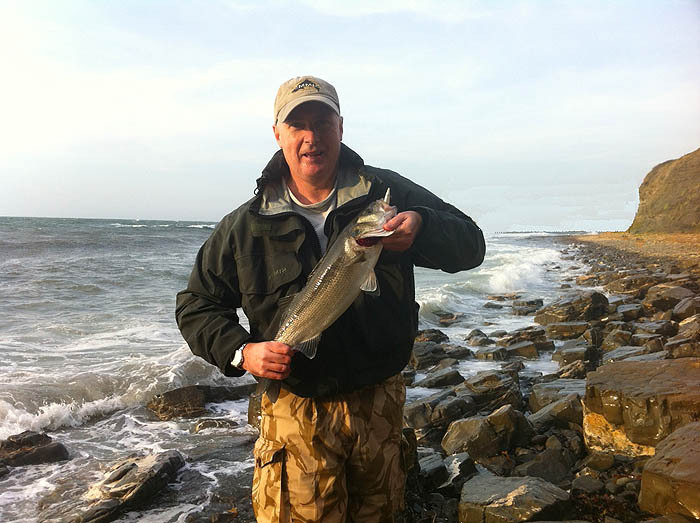 With the back feeling better after a spot of physio I ventured to the coast and had a few bass and pollack on lures. However, I have one more account from Bill and his pals which may be of interest. Hopefully, after this (and a bit more manipulation of the back) I'll be fishing more myself - although by this time of the year it might be mostly in the River. The three of us arrived on the shore at 0930. For the first time in ages the water was pretty clear & we thought things looked promising. We each spent 5 minutes hurling semi liquified rotten seaweed into the water in the hope of getting things going. We then all started to fish with Redgills. We walked up and down the small bay and out onto the ledge with no luck. As high tide approached a dozen or so mullet showed up, I'm not sure if our weed hurling had anything to do with it but every now and again we'd chuck some more of the disgusting stuff in. Andy tried a maggot fly for a while, I tried the Yo-Zuri Tide Minnow I found the other week and then a Picol Eau, marching up and down still with no luck. About an hour after high tide with nothing doing I decided to head east 500m. I fished a Redgill over a partially submerged ledge. Thump, a nice 2lb+ bass put a bend in my new rod. I weaved it between the rocks and brought it ashore! 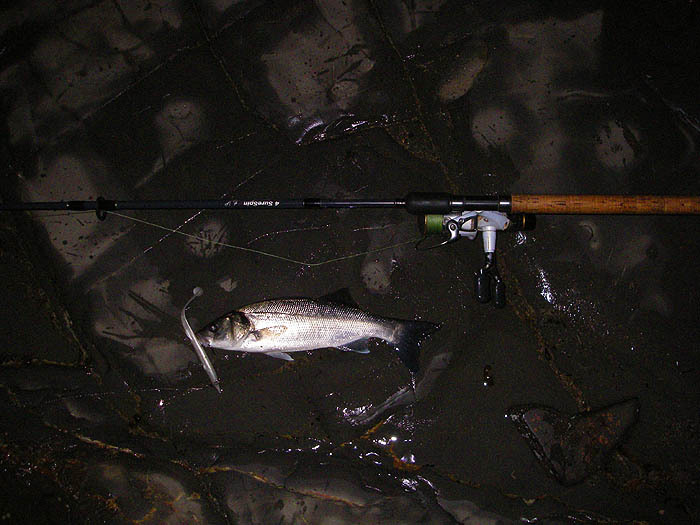 New rod christened, excellent! Two casts later and thump, the twin brother or sister of the first fish was brought ashore. I whistled to Mike and Andy to try and get their attention but they were way too far away to hear me. I stayed at this spot for another 10 minutes or so and then headed back to meet up with the others who were still both fishless. They started to head back while I stayed for a further 10 minutes at the shingly stretch and had another fish on for about 10 seconds, but somehow he slipped the hook. This was no monster, I was disappointed but not enough to suffer the MFLSD (massive fish loss stress disorder), which has lasted most of the week. We got back to our cars having fished 09.30-14.30 with only two fish to show for our efforts between the 3 of us. 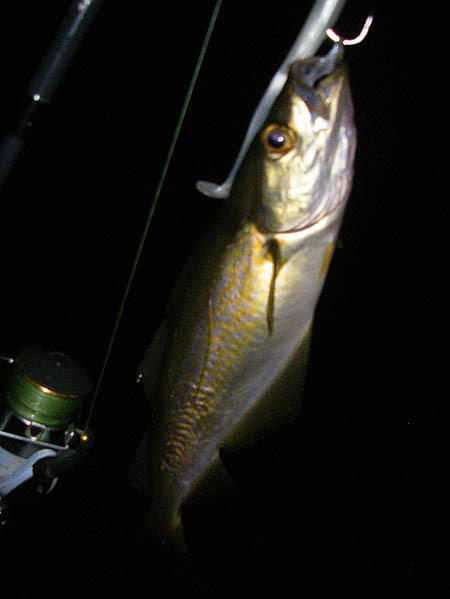 You were right about the tide being a bit small, no maggots and no vast abundance of big fish like Sunday. I'll put a note on the calender to try and go and have a look next time the tide conditions are the same as last Sunday. Bill's subsequent email was much shorter and more to the point. He'd opted not to go with his pals on their next sortie. AAAAAAARRRRRRGGGGHHHHHHH I should have gone with the lads!!!!!! Now, after reading the email, forwarded to me by Bill from his mate John, you'll see exactly what he meant. Not long been back home. It was absolutely brilliant! I don't think I would have bothered to walk around to the west as it was a bit 'sloppy' to say the least. It was pretty breezy but the waves weren't crashing into the Bay like they sometimes do. Anyway, we started fishing at about 14.30 and Rob had a fish first cast (about 1.5lb), ten minutes later I had one of 2lb. Rob doesn't really fish so I was really chuffed when he got another fish approaching 2.5lb. I was still chuffed for him on his 3rd and 4th fish. By fish 7(!!) I was beginning to feel less benevolent and would rather having been fishing myself than helping him land his! Anyway I finally got myself back on track with two good fish, one 4lb (weighed) and another 4lb+. Rob just couldn't stop catching and we lost count how many fish he ended up with. It was at least ten and he lost 3 more. I ended up with four fish myself. I had told Rob I thought it would be too windy and not to get his hopes up on our way down to the coast. How wrong could I have been, he must think this fishing game is a doddle. I'll e-mail some photos over to you once Rob forwards them to me. I'm away for the next two weekends but I'll try and squeeze a trip in sometime. PS Every single fish taken on the weighted Redgill. John kindly filled in the picture a bit more for me with another email. John here. I just thought I'd add a bit more detail about my trip on that Bill has mentioned to you. I fished the same spot some weeks ago with some mates of mine, Rob and Gary, neither of whom are avid anglers. Anyway we had a reasonable night, I had one fish, Rob had one bass and one pollock, Gary hooked three fish on and lost them all. This was enough to inspire Gary into more trips and I've been out with him for a further five sorties where he hadn't had a single knock let alone a fish. On Sunday Gary had family commitments so couldn't make it out, so I went with Rob (for his second trip out). I'd warned him that fishing mid afternoon in a F6 SSE wind wasn't going to help our cause (how wrong I would be proved to be). We arrived at about 14.30, and, as forecast, it was pretty breezy, but the waves were rolling in rather than crashing against the shore so fishing wasn't too bad. 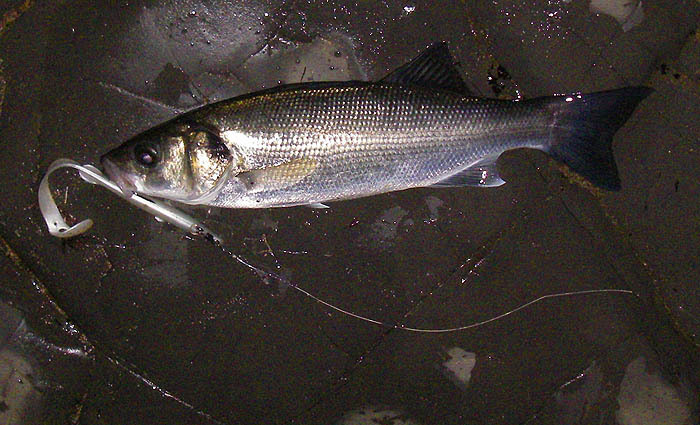 The bay was full of weed and there were already dozens of mullet working the surface. I got Rob to fish just beyond me with the intention of casting along the ledge. Rob had a fish first cast (about1.5lb). Rob needed to get home for 18.00 hours so we left at about 17.30 but I'm sure we (well Rob anyway) would have continued catching. In the space of three hours we'd landed fourteen fish most of which were around the 2lb+ mark. Rob took a fish home for his son (Rob's vegetarian), which I filleted for him. The gut was full of bits of weed and brown 'gunge', the only discernable thing I could see was a fair size crab claw. It's ironic that Gary had put in all the time and heartache and Rob grabbed all the glory, still that's fishing, being in the right place at the right time. Not bad eh? You see that you don't always have to get up at the crack of dawn to catch bass on lures and even an inexperienced angler like Rob can catch plenty of fish if they are there and feeding - no wonder Bill felt a bit peeved. I'm sure that the 'brown gunge' in the one fish that they kept must have been Idotea. Fish that are feeding on them will sometimes take a bigger lure with gay abandon. To be honest, if I'd been fully fit I expect I'd have been down there before them (in the early morning) b****r!! !